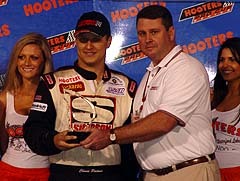 The 2005 Hooter Pro Cup Series Southern Division opened to many curious eyes at USA International Speedway for several reasons. Not only are the biggest guns in the series back to battle it out yet again, but they are joined by several new short track veterans who are making the Pro Cup Series their new home and a plethora of new rookies, many of which are coming in with big teams and big names. 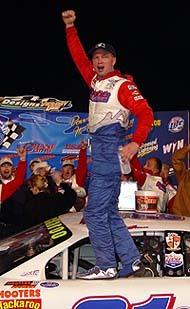 Cup regulars was Shane Huffman switching from Xtra Motorsports (who he won the championship with in 2003) to the brand new Knight Motorsports team. Huffman showed up to Lakeland with the new team and a new look and new color. Gone is the black #84. In is the white and blue #81. 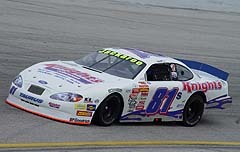 But the car was the same; one the team bought from the now defunct Xtra Motorsports team and one that Huffman ran at Lakeland at the end of 2004. And many of the crew members came over to Knight Motorsports from Xtra Motorsports. Put it all together and it resulted in the same ending for Huffman on Saturday night. On Saturday night, all of those factors had a hand in the outcome of the race. It started in qualifying, with three Rookie of the Year candidates grabbing the top four qualifying spots, including a surprising pole sitter… former Legends car standout Chase Pistone. Outside of Pistone on the front row was a man not new to the short track world, but new to the Pro Cup Series… former ASA standout Mike Garvey. However, in the end, it was the Pro Cup veterans, and Garvey, who decided the outcome of the event. Huffman passed another Pro Cup newcomer (sort of), Toby Porter, on lap 148 and never looked back, holding off a charging Garvey to open the year in style. “I knew. I just knew,” said Huffman. “I had a good feeling when I got up this morning and most of the time, they are not wrong. You can just tell. The car just ran awesome all night. We qualified a little bad. We were the first car out in the first race of the year. I knew we had a good car in the long runs. So we just worked our way up to second. Garvey had the oppositie off season at Huffman. He’s got the same team. He’s got the same colors. But the car and the series are new. But, like Huffman, the results were the same for Garvey. Shane Huffman got back to his winning ways on Saturday night. 124, when Porter took the lead by staying out on the track. During that round up pit stops, Huffman and his team got him out first, while Garvey had to come back down pit road again to replace a couple of lug nuts that fell off the car. That put Garvey even farther back in the pack and might have been the deciding factor in not winning in his first Pro Cup race as a full-time racer. Rogers finished third, with Matt Carter and Randy Gentry coming home fourth and fifth. Shane Wallace, Steve Wallace, Porter, Jason Sarvis and Billy Bigley Jr rounded out the top-10. Mike Garvey's car looked the same and he drove the same. Huffman worked his way up through the field and passed Porter and never looked back, despite a hard-charging Garvey, who made it up to second just as the checkers were about to wave by passing Clay Rogers. “It was a good return, but we were hoping for more,” said Garvey, who was a five-time winner in ASA last season. “This car was really good. We had some lugnuts fall off on our pit stop and we had to come back in to get them back on. I used the car up then trying to come through the field. For Huffman though, there was much more to celebrate than just a win. Last year at this time, Huffman was with a great team (Xtra Motorsports), but the team was racing on a limited budget, even after coming off a championship season. This year, Huffman has it all right at his feet. “This is such a good deal, I can’t even explain it,” said Huffman. “These guys, Pete and Bud Knight and everyone, have given me an opportunity of a lifetime here. They are behind this deal 110-percent. I couldn’t ask for anyone any better. We have an awesome group of guys. A lot of them are the same that we had last year. There are some new ones too. And they are gelling well, but nothing helps like a win. “The difference from last year to this year is from one end to the other. We were able to race competitively last year, don’t get me wrong, but we didn’t have the money to do what I feel like some of the other guys were doing. Pete and those guys are committed to doing whatever it takes to be winners. The car and the team looked different for Shane Hufman, but the result was all the same. And Huffman is optimistic about the season… and maybe a little superstitious.